Premium and Hard Wearing. 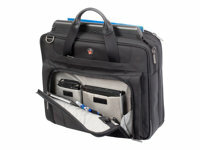 Corporate Traveler laptop bags are hardwearing offering outstanding laptop protection with patented SafePORT Protection systems. Built to withstand the wear and tear of everyday business travel with military grade nylon exterior and premium internal lining. Excellent organization with multiple pockets and storage options for files, books and accessories plus a removable accessory pouch. Your carrying comfort is assured with molded carry handles and the Equalizer shoulder strap; a thick flexible pad to take the strain out of a heavy load by evenly distributing weight across your shoulder.